These 10' gambrel shed truss plans will show you how to build a gambrel truss that is 10' wide and will have 63" headroom off the loft floor. The blueprints for these gambrel trusses show both the interior truss construction and the construction of the end truss, or gable end truss. Connections of the truss ends are done with pre-made gussett plates made from 1/2" material such as OSB or plywood. Start Building Your 10' wide Gambrel Shed Truss Today! 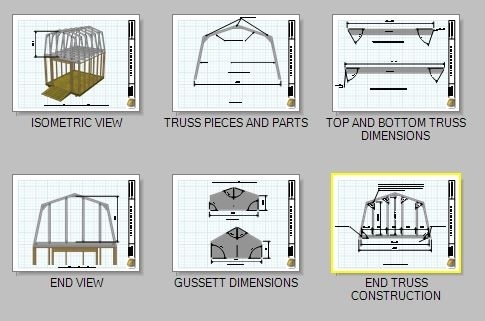 The blueprints for these gambrel trusses are in pdf format and immediately after purchase you will receive a link for your download. If you experience any problems whatsoever with the download, or you do not receive the download link, please contact me. Use the paypal button below for secure purchase for $15.00. The plans are in pdf format and upon purchase you will be provided a link for your immediate download of the plans. See all of my shed truss plans here.